The glass installation hangs in the rotunda of the $15 million Sara T. Landess Technology and Learning Center on the main campus of Clark State Community College in Springfield, about 30 miles from Dayton. 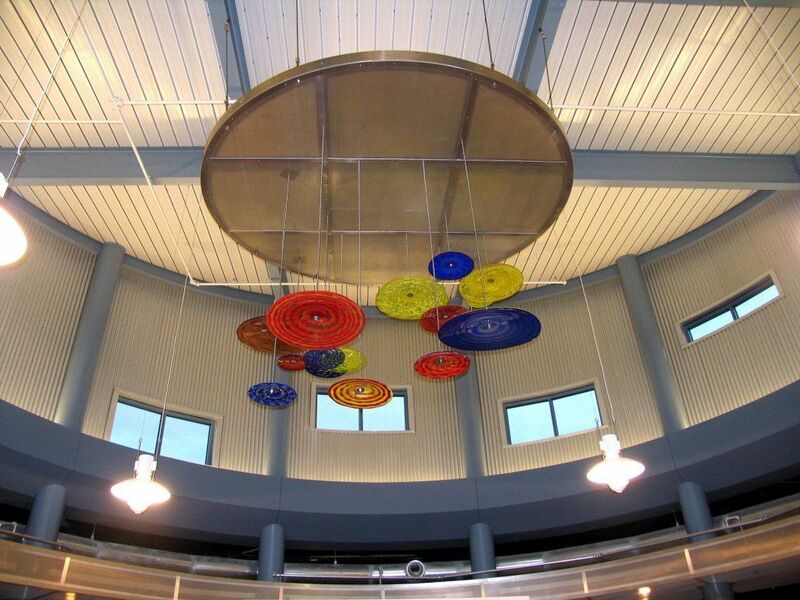 The piece is comprised of 15 colorful blown glass disks suspended from a 25-foot ceiling. The largest piece is 30 inches in diameter. Its dimensions are approximately 12 feet by 8 feet. The sculpture adds color and catches the sunlight in the steel, concrete and glass building. The recently completed building is approximately 55,000 square feet and houses the college’s library, student services, classrooms and labs.